Hello again!. This is my card I made for January. I used red, and pink solid colored paper as well as the printed giraffe and pink polka dot paper too. I found the pink doilies and the ribbon from the craft store - thought it would look cute. I really didn't know if what was in my mind was going to get to my fingers lol - but it did and I love how it turned out!. I decided to use two different stamp kits to create this card. 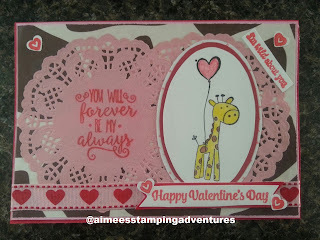 For this card I used a few stamps out of the "Love Is A Magical Thing" stamp kit, and also from the "I'm Wild About You" stamp kit. I think it came out cute and hope my boyfriend loves it as well - I can't wait to give it to him!. Happy stamping!!. Awww thank you Eva!!. I had fun making. I love giraffes and this made me smile.